Dating back to the 7th century, Buckingham was established in a naturally good defensive position in a loop of the River Great Ouse. Its name is said to come from 'Bucca' who was the leader of the first Anglo Saxon settlers - the literal translation of Buckingham is 'meadow of Bucca's people'. The river formed the border between the Saxons and the Danes and Buckingham changed hands many times over the years. 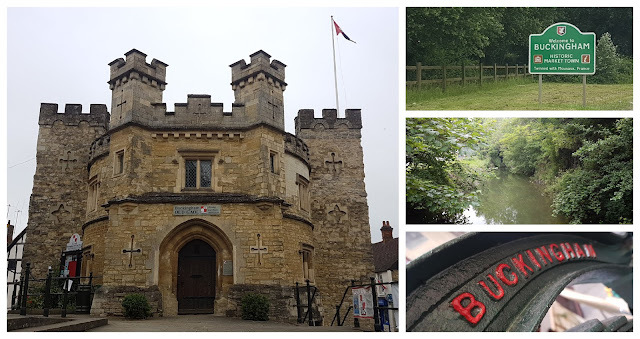 In the 10th century Buckingham became the county town of Buckinghamshire - at this stage and for many years this was an important and prosperous place. It had its own mint producing silver pennies and in 1554 received its Royal Charter. In 2014 a metal detectorist found a huge coin hoard in a field just outside the town, it contained over 5,000 silver coins and is known as the Lenborough Hoard - it has recently been valued at £1.35 million. In 1703 The first Duke of Buckingham and Normanby built a townhouse called Buckingham House in London which was acquired by King George III in 1761. A major enlargement project took place in the 19th century and it was renamed Buckingham Palace. It became the official residence of the Monarch in 1837. Whilst in Buckingham, the Duke would have resided in the magnificent Stowe House, which is now Grade I LIsted and owned by the National Trust. Turning our attention back to Buckingham, the town was a major centre for a wide range of industries including tanning, candle making, goldsmiths and many more. However the good times didn't last, famine, a devastating fire in 1725 which destroyed about a third of its dwellings, and being hit extremely hard by the plague, the town had a final twist of the knife when, in the 18th century, it was replaced as the county town by Aylesbury. Modern day Buckingham is a delightful historic town with many narrow windy streets, and despite the fire has a fine collection of historic buildings - Georgian architecture is widespread in the town and these buildings were built to replace those that suffered in the fire, but there are a fair number of older timber framed buildings still standing. A Gaol which was originally built in 1748 still stands and is now a museum. The site of the original settlement now houses the University of Buckingham which is the only university independent of direct government support in the UK. The town itself has spread mostly to the north and west of that original settlement in the loop of the River Great Ouse and boasts a population of around 12,000 people. At time of writing it is also represented in Parliament by the current Speaker of the House of Commons. I visited the town in June 2018 to take part in Buckingham parkrun which has been in operation since May 2014. 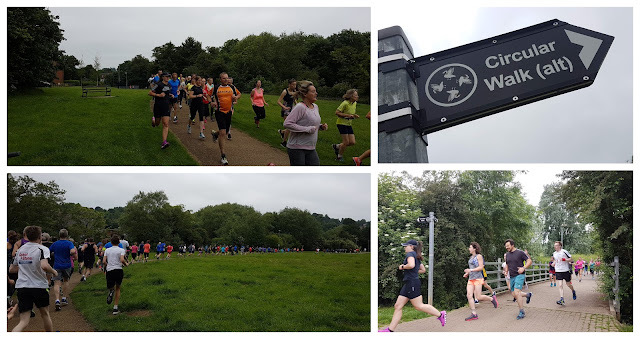 Attendances have grown steadily in that time and at time of writing you'll probably find a field of just under 300 participants every Saturday morning. It takes place along the banks of the river and its route meanders around two different parks. Travelling to Buckingham by car is fairly simple and parking can be found in Cornwalls Meadow Car Park for a very reasonable 50p for up to three hours. It is just a couple of minutes away from the start area, which is located next to the Bridge Street Skate Park. Those who travel by bicycle are advised to use the bike racks at the local Waitrose supermarket. Toilet facilities can be found in the car park. For anyone wishing to arrive by train, sadly this is no longer possible. When the railways were being built, the original plan for the London-Birmingham railway included Buckingham on its route. However the 2nd Duke of Buckinghamshire opposed this, fearing what would become of the town so the L&BR changed their plans. A number of years later, a branch line did run through the town and was fairly successful as a goods route. Sadly the passenger services were not very popular and the line was gradually closed down during the 1960s. 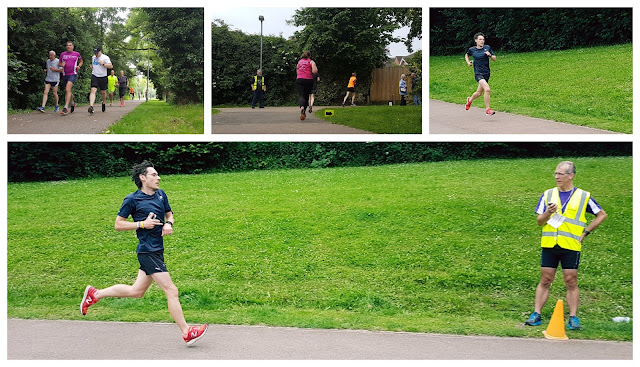 So after parking the car and heading off for a quick jog around the town centre, I arrived at the Bridge Street Skate Park just in time to listen to the run briefing. After that, the day's participants were set off on their regular Saturday morning run. 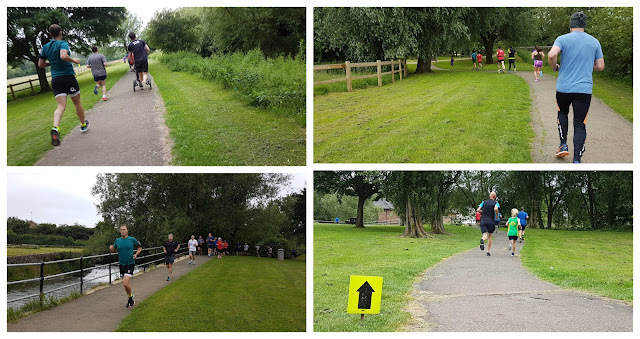 jog or walk around the picturesque riverside course. Underfoot is all tarmac, so road shoes are the way to go all year round. The course is mostly flat and fast, and perfectly fine for a spot of buggy running. 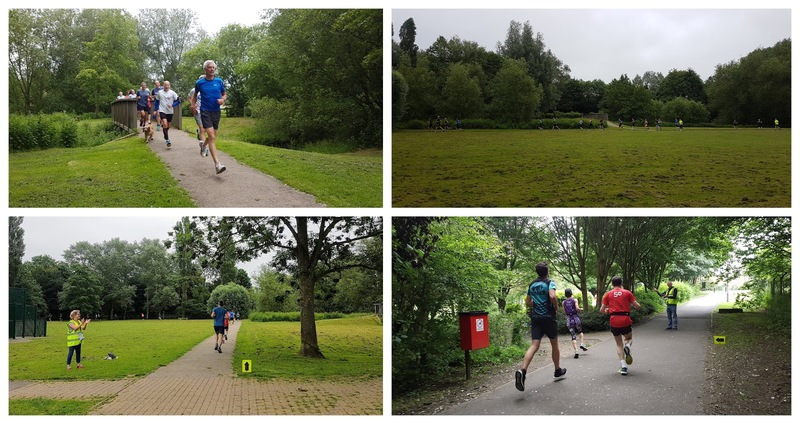 The course layout is that of a lollipop - the official description is 'you run out on the stick, lick the lollipop twice, and then run back along the stick'. Starting at the Skate Park, the course heads through the area known as Heartlands. Travelling to the north along the winding Buckingham Circular Walk path until at around 600m there is the first crossing of the river via a fairly wide bridge. This brings the route onto the Ouse Valley Way where it follows the course of the river. 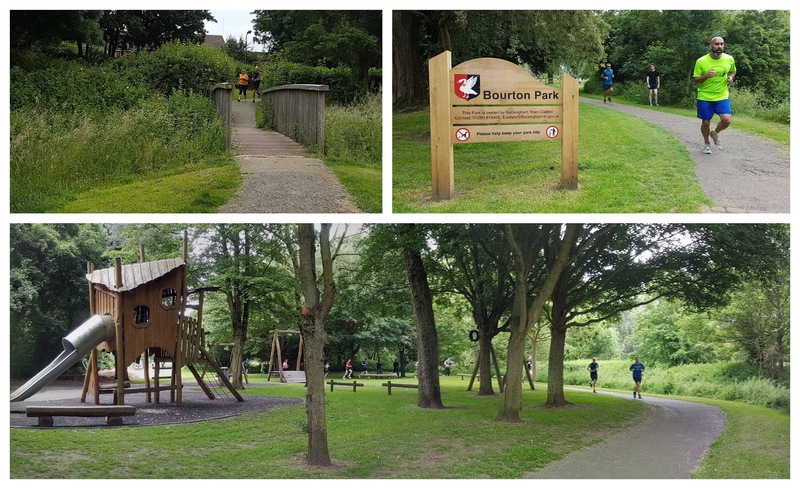 At around 1 kilometre into the run, the course enters Bourton Park and there are now two anti-clockwise laps of this park to complete (the sweet lollipop section). The paths generally meander left and right, which gives a great flow and is very enjoyable to run. The loop also includes a couple fo narrow bridges to cross. Once the two laps are complete, the route leaves this park and heads back along the outbound route all the way back to the Skate Park. The whole route is flat except for the opening and closing 400 metres or so, where the paths gently passes over some very mild undulations. Once back at the Skate Park, barcode scanning is taken care of by the volunteers and once everyone is finished it's time for a spot of breakfast. 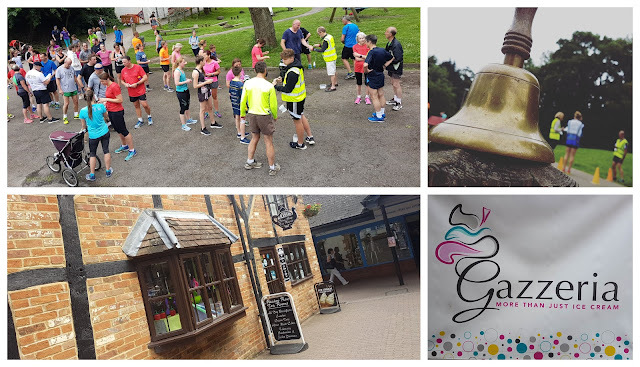 Before heading off for breakfast, if you have run a PB you can have a quick ring on the PB Bell, which is great fun. The officially listed spot for post-run social is at the Gelateria Gazzeria where you can get some light refreshments. We chose to head into one of the local tearooms for a more substantial breakfast before spending some time exploring the town where we visited the Old Gaol (who have a small display of coins from the Lenborough Hoard) and The Chantry Chapel which is Buckingham's oldest building. We rounded the day off with a visit to Gelateria Gazzeria and I had some fantastic melon sorbet which I hear is made onsite. 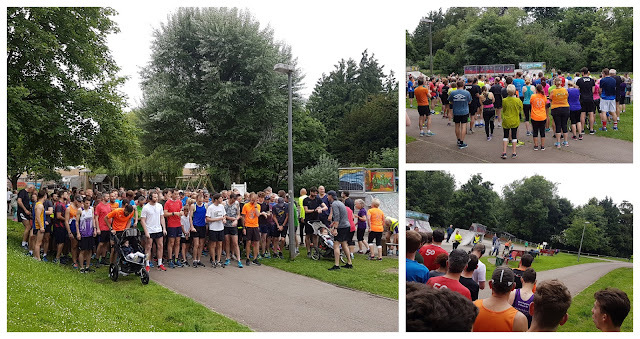 The results for event 218 were published shortly after and 240 people took part. I recorded the run with my Garmin and uploaded the course to Strava, and as always I transferred that data to the Relive app on my phone where a course flyby video was generated. It had been a great morning out and I enjoyed my run very much especially the meandering paths. A huge thank you to all the volunteers.